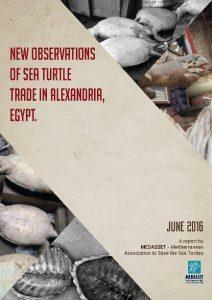 We have just published a new Report that presents the full findings of our 2014-2015 survey on the illegal trade in sea turtles in the fish markets of Alexandria in Egypt. Between September 2014 and March 2015, with the help of young volunteer Sherif Abdullah, and under the supervision of Mohamed Nada, we organised a new survey to reveal the current status of the trade in Alexandria’s fish markets and to gain insights into the local community’s perceptions. Sherif visited fish markets and artefact shops and also tracked down covert trade locations or storage rooms, to observe their activities. He took considerable personal risks in doing so, as sea turtle trade is illegal in Egypt. He recorded both open and covert trading taking place in 6 markets in 3 areas of Alexandria. The trade has increased by 60-120% in comparison to surveys in 1998-1999 and 2007. The last survey in 2007 had shown that open trading at least had ceased thanks to past efforts, though some covert trading persisted. Sherif also carried out interviews with 148 fishermen, fishmongers and members of the public in the markets. Though most were aware that sea turtles are endangered and that it is illegal to harm or eat them, eighty-six percent of respondents had consumed sea turtle meat, mainly influenced by local traditions, curiosity or the alleged health benefits. Both loggerhead and green turtles are traded, though green turtle meat is preferred by consumers. Larger animals are particularly targeted by the trade, which means that the death toll is heavier for adult individuals of breeding age, and unfortunately these are the animals that are most valuable to the recovery of sea turtle populations. The rare leatherback turtle (Dermochelys coriacea) is also traded, as was revealed during the police operation carried out by Egyptian authorities in May 2015 after we submitted our survey’s preliminary findings, which included a list of locations where illegal trading was occurring. Fishermen either slaughter turtles on board to consume the meat or sell the meat directly to customers. They also bring live turtles ashore and sell them to fishmongers. Three fishmongers are specialised in turtle trade and at least 36 trade sporadically. They keep turtles alive from 1 to 30 days until slaughter. Rendered helpless by being turned onto their backs, turtles suffer from exhaustion, dehydration, injuries or disease. Fishermen and fishmongers also supply the local artefact market. The sale of embalmed sea turtles and shells was observed in shops. We also recorded artefacts made from the shells of hawksbill sea turtles (Eretmochelys imbricata), a critically endangered species not present in the Mediterranean but which does occur in the Red Sea. Interviewees reported the sale of sea turtle artefacts to tourists, which may imply infringements of CITES rules (Convention on International Trade in Endangered Species). Our survey demonstrates that the trade has yet to be eradicated in the fish markets of Alexandria, which is the last major hotspot of illegal sea turtle exploitation in the Mediterranean. In addition, interviews revealed a 90% death rate of sea turtles that are caught by Alexandria’s fishing fleet, which is likely much higher than that of other fisheries in the Mediterranean that are not supplying an illegal sea turtle meat and artefact market. Halting the trade will obviously benefit sea turtle population recovery across the Mediterranean, and our report reconfirms Egypt’s importance as a priority area for marine turtle conservation. We provide useful recommendations on necessary action in relation to action plans, law enforcement, educational and behaviour-changing campaigns, surveys and activities with fishermen, sea turtle rescue, capacity building, empowerment of local civil society, etc. We have formally submitted our Report to Egypt’s Ministry of the Environment and offered to work together with Egyptian managers, decision-makers and conservationists to assist in ending the illegal sea turtle trade in Alexandria. About sea turtles in Egypt: A few green (Chelonia mydas) and loggerhead (Caretta caretta) turtles nest on Egypt’s north Sinai coast. However, Egypt is very important for sea turtles that nest in several other Mediterranean countries, as they migrate through and remain in Egypt’s coastal waters to feed or spend the winter months. This means that it is important that sea turtles in Egyptian waters are safe from fishing, pollution and other human threats. However, sea turtles in Egypt face an extra danger: illegal sea turtle trade, which has been known to occur since the early 20th century. Sea turtle meat and blood consumption, which is uncommon in the Mediterranean, has been recorded in Alexandria since at least the 1970s.